Throughout the 1950s, broadcast television was limited to domestic transmissions simply because we didn't have a means to relay signals far enough to span the vast expanse of the Atlantic Ocean. It wasn't until NASA shot Telstar, an unproven, newfangled "active" communications satellite into orbit in 1963, that mass media truly become an international phenomenon. Science-fiction writer Arthur C. Clarke may be credited with first envisioning an active satellite (one that "actively" re-transmits signals, not just reflect them) in 1945 but it was John Pierce of Bell Telephone Laboratories that proved they could work in his 1955 paper "Orbital Radio Relays" in the journal, Jet Propulsion. However, it took five years of cajoling his management—during which time Soviet Russia launched Sputnik and started the Space Race—and the formation of NASA for Pierce's idea to come to fruition. In January 1960, AT&T, NASA, Bell Telephone Labs, GKO (a British telecom), and National PTT (a French telecom) all entered into an agreement to develop satellite communications over the Atlantic Ocean by building, launching, and operating an experimental satellite based on Pierce's design. Bell Labs would build the satellite, NASA would launch it, and the telecoms would be responsible for its operation. This sort of public-private cooperation was unheard of in the fledgling aerospace industry and would become the first privately sponsored space launch in history. The nearly spherical, spin-stabilized satellite, dubbed Telstar 1, measured 34.5 inches wide at its equator and weighed just 170 pounds, which is the only way they could get it to fit aboard a Delta rocket. It's outer surface was blanketed in solar panels that generated 14 watts of power, just enough to drive the active relay. The satellite received 6 GHz signals via a ring of antenna elements running around its waist, converted that signal to 4GHz and then re-transmitted it through an omnidirectional antenna mounted in the surface of the satellite. Because the signal from the satellite wasn't particularly powerful, the receiving dish on the ground, located in Andover, Maine, had to be huge—like a 160-foot-diameter horn antenna—and had to be protected from the elements by the largest air-supported structure in history. Launched aboard a Thor-Delta rocket in July of 1962, Telstar 1 entered into its elliptical orbit without trouble and, unlike modern geosynchronous com-sats, began circling the globe roughly once every two and a half hours. This allowed for just 20 minutes of live transatlantic feeds out of every 150. Still, it was better than nothing. The satellite immediately went into service upon being launched, transmitting the first privately-broadcast television pictures in history, depicting a flag outside Andover Earth Station out to Pleumeur-Bodou, France, the very next day. It successfully tested its ability to relay fax and telephone transmissions as well. Two weeks later, Telstar 1 again made history by relaying the first publicly available live transatlantic television signal on July 23. The first broadcast was supposed to be of President Kennedy addressing the strength of the dollar—an issue that was of keen concern to Europe at the time—but the satellite's transmission window hit before the president was ready so CBS had to fill in with a televised baseball game between the Phillies and Cubs at Wrigley Field. Tony Taylor flew out to right fielder George Altman off a pitch by Cal Koonce before the feed flipped back to President Kennedy. Telstar 1 continued to operate throughout most of 1962 before we kinda accidentally killed it with a nuclear missile test. The day before the Telstar 1 launched in 1961, the DoD conducted a high-altitude nuclear bomb test in the upper atmosphere. The fallout from the test energized the Van Allen Belt, where the Telstar would operate, with a potent dose of radiation. This, along with similar and subsequent hihg-altitude tests by both the West and the Soviets, quickly fried Telstar's transistors. The satellite failed in November, 1962, was briefly revived in January, 1963 before dying completely and being replaced by its identical twin, Telstar 2, in May, 1963. 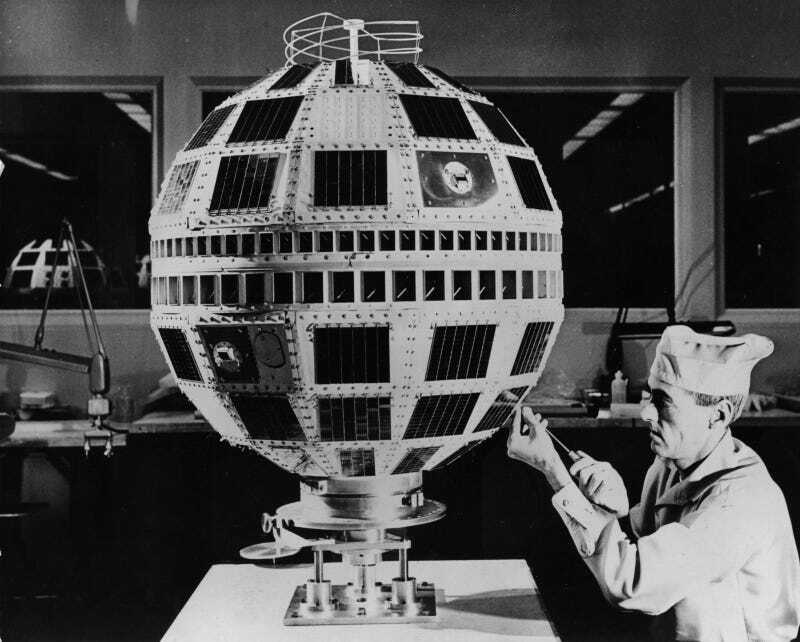 Telstar 2, however, launched to a higher orbit where it would be clear of the harmful radiation.